My goal as a fitness instructor is to engage clients – body, mind, and spirit. Pilates, originally called, Contrology, is a very mentally focused form of exercise to not only strengthen the body, but also one’s connection to their body. The goal of Pilates is not to perform a perfect exercise routine in the studio, but rather to take the benefits of Pilates – strength, balance, physical awareness, posture, flexibility, coordination, stamina – into your daily life. 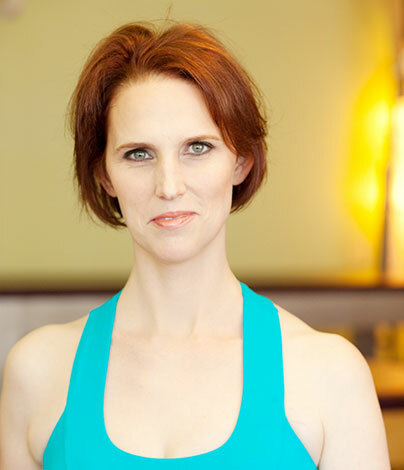 My goal in teaching Pilates is to turn your body into a tool for healthy, pain-free living. Pilates gives you a body that enables you to live out your goals, instead of impeding them. I came to Pilates looking for a way to slim down and feel better. In college, I read an article about Pilates in Elle magazine and had always wanted to try it. Not able to afford private instruction, I started teaching myself the exercises through Brooke Siler’s book The Pilates Body. The positive changes and experiences in mind, spirit, and especially body motivated me to continue practicing. As I taught myself the mat exercises from Brooke’s book, I fell in love with Pilates. I loved that I felt stronger right away and that I didn’t have to go to the gym. As I lost inches off my waist and hips, I noticed that my focus and concentration had increased. Pilates is a mind, body, and spirit workout. To truly achieve the benefits of the work, you need not attack the exercises, but tune in with your own body and tap into all the strength and potential it has. Furthering my knowledge and practice with my ballet instructor Ann Monahan, I began substitute teaching. At this point my journey toward teaching professionally was set into motion. I became a Power Pilates certified instructor in 2004. In 2005, I opened In & Up Pilates in Silver Lake, and brought classical Pilates to the neighborhood. In recent years, I’ve added TRX for clients who want a more traditional approach to weight training and the MELT Method Hand and Foot work for pain management. BioReprogramming is a method of using conflict resolution to release emotional stress in the body. Pilates is at the core of all the work that I do, but I add in the other techniques to better enable clients to get the most out of their workouts. In my growth as an instructor, I have developed and nurtured a great love for teaching, for facilitating awareness within each client, and developing an eye for clients’ individual needs. For me, one of the beautiful things about Pilates is that there’s always a deeper level to the work. It’s never boring or unchallenging. And motivation is easy: one of my teachers says ‘Our true salary is our clients’ success.” and I heartily agree.